Richard Burr, born November 30, 1955 (age 63), Charlottesville,Virginia, is a liberal-leaning Republican United States Senator from North Carolina, who caved into the homosexual agenda on don't ask, don't tell and has voted at times with the pro-abortion side. In 1995, after running an unsuccessful bid for Congress in 1992, Burr was elected to the United States House of Representatives. 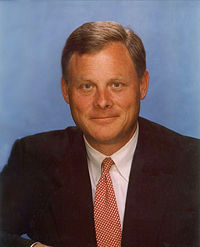 After his congressional term ended in 2005, he ran a successful campaign for the United States Senate. Burr has voted with a majority of his Republican colleagues ninety percent of the time during the current Congress. Despite accusations of being supportive of the Uniparty, Burr supported the revocation of ex-CIA director John Brennan's security clearance after Brennan's roll in the Trump-Russia scam came to light. In 2003, incumbent Democratic Senator John Edwards announced he will not run for a second term in order to run for President. The race for his Senate seat became competitive, with Republican Richard Burr defeating Democrat Erskine Bowles by five percentage points. In the Senate, Burr serves as ranking member of the Senate Veterans Affairs Committee where he works to improve the quality of health care and service veterans receive. Burr also sits on the Senate Intelligence Committee; the Health, Education, Labor, and Pensions Committee; the Energy and Natural Resources Committee; and the Indian Affairs Committee. Burr is a conservative who is pro-life, supports the death penalty, and favors smaller government and lower taxes. This page was last modified on 13 February 2019, at 20:45.